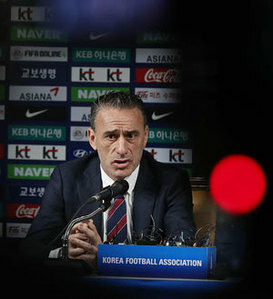 Korea is set to have its second match under the leadership of Paulo Bento, the head coach of the national football team, in a friendly against Chile in Suwon, Gyeonggi Province on Tuesday. Chile has turned itself into a team to be reckoned with over the past decade, winning the 2015 and 2016 Copa América by beating traditional powerhouses such as Argentina and Brazil. Korean footballers train ahead of a friendly against Chile at a stadium in Suwon, Gyeonggi Province on Monday. Chile competed in last year's Confederations Cup as the Latin American champion, and finished second to Germany. Chile is ranked 12th in the FIFA world rankings for this month, much higher than Korea's 57th. Bento said he considers Tuesday's match an opportunity to test the results of the team's first practice session over the past week. "It will be an opportunity to check the progress of our weeklong training. I want to see whether we can maintain our own style of play even against a strong opponent," he said at a press conference on Monday. Fans have showed renewed attention to the new manager and the team. All advance tickets have sold out, with only the 200 seats remaining -- out of the total 40,760 seats -- reserved for match day sales.